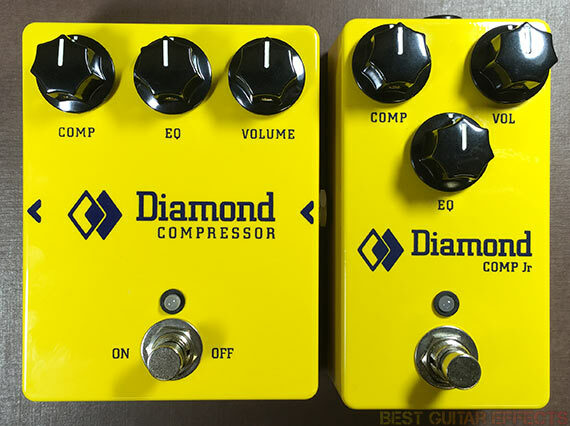 Diamond Compressor & Comp Jr Review – Best Optical Compression Pedals? In 2004 Diamond Pedals began work on creating a unique compression pedal that would essentially be a channel strip for guitar, similar to a vocal channel strip found in a recording studio consisting of preamp, compression, and EQ. The end result was the Diamond Compressor which has become one of the more highly regarded compression pedals in recent years since its release. While guitarists have sung the praises of the original Diamond Compressor, one common user request kept coming up: could it be more compact? Thus the Diamond Comp Jr was born. We thought this would be an auspicious time to review the Diamond Compressor & Comp Jr to see just how good they really are while assessing how they compare to each other to find out if the Comp Jr is a faithful successor to the original. There is a word in Sanskrit, śūnyatā, which is often translated as “emptiness”. Essentially, it refers to a “voidness” or having a lack of inherent qualities. An optical compressor represents this concept particularly well in that it relies upon a sealed, empty void where no light can enter. In this ‘optical isolator’ chamber exists some kind of potential light source (in these pedals, an LED) and a photocell resistor to receive that light. And just as a Buddhist monk meditates upon emptiness, hoping to finally catch a glimpse of the clear light of enlightenment, so too does the optical compressor’s photocell wait to receive a “flash of lightning in the darkness”. And every time your guitar signal passes the compression threshold, the light appears, the abyss is crossed, and your guitar’s volume is attenuated – or “compressed”. You’re one step closer to achieving tonal nirvana. But the Diamond Compressor & Comp Jr are armed with more features to help the aspiring guitarist towards the pure land of tonal bliss, the EQ knob being of particular importance. More than a generic ‘tone’ knob, the tilt EQ control on these pedals gives you a precisely flat response at the noon position. If you turn the knob counterclockwise, you’ll get an elevated bass response and reduced treble. If you turn the knob clockwise, you’ll achieve more high-end presence and less low-end. It’s like a seesaw in how it leans your tone towards either end of the frequency spectrum. The only question left is this: do you choose the Greater Mayahana path (Compressor) or Smaller Hinayana path (Comp Jr)? The Comp Jr isn’t meant to replace the original Compressor. Both pedals have a few distinguishing factors to make them worth considering. The 2 notable advantages of the new Comp Jr are its compact size and top-mounted jacks. The original Compressor is significantly wider with extra pedalboard placement considerations needing to be made to accommodate its side-mounted in/out jacks. (The Compressor takes up nearly twice as much space as the Comp Jr when cables are plugged in!) The Comp Jr’s case is slightly taller, but this shouldn’t affect performance. The original Diamond Compressor is built with larger, higher quality components. Theoretically, this could offer higher sound-quality. (We’ll find out in a moment.) The EQ knob on the original Compressor uses a potentiometer that has a center indent to allow precise setting to a ‘flat’ noon position. More noteworthy, however, is that the original Compressor has an internal switch for removing the EQ from the circuit if you really want to ensure it has no effect on your signal. And there’s a Hi-Cut jumper that allows you to roll off the high-end at around 4.8kHz, perhaps useful to guitarists who mostly play the Diamond Compressor into higher gain distortion pedals. The absence of the additional internal controls is the most notable feature difference, but these may not be relevant to many guitarists anyway. Here’s a detailed feature/spec comparison before we continue. Vactrol opto-isolator variable resistance path as used in high-end studio compressors for smooth attack and decay characteristics while preserving initial signal transients. Post-compressor ‘tilt’ EQ knob provides a very musical tailoring of frequency response – seamlessly transition from a darker jazz voicing to a bright jangle, with flat frequency response at the center detent position. Comp knob controls the amount of compression to be applied to the guitar signal. Volume knob adjusts the overall output volume of the compressor. Optimized gain staging and use of ultra low noise transistor and opamps in signal path for lowest possible noise and extended signal headroom. 9V battery power, with standard 9V negative tip adapter ready. Bi-color LED provides visual indication of depth of compression and power. EQ In/Out (internal) – This switch removes the tilt EQ circuit from the signal path. Although the EQ gives a flat frequency response at the center detent position of its control, this switch is provided for those who wish to bypass the EQ processing entirely. Hi-Cut jumper (internal) – This jumper is factory set so that the 4.8 kHz hi-cut filter is not in the signal path. However, if you use the compressor frequently in front of a high gain device like a distortion pedal, you may want to enable the internal hi-cut filter by setting its jumper to the on position. Top-mounted jacks on a small enclosure for tight pedalboard layouts. Premium audio components, including tight tolerance Panasonic PPS capacitors and metal film resistors. 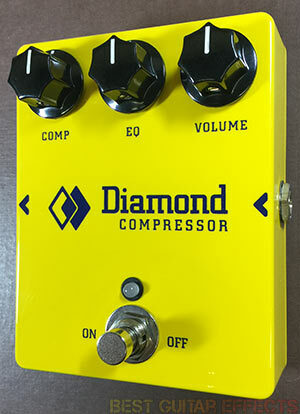 Visit Diamond Pedals for more info about the Diamond Compressor & Comp Jr.
I’ll be referring to both pedals as they generally function and sound the same. And if you’ve played the original Diamond Compressor that may be all you need to hear anyway. 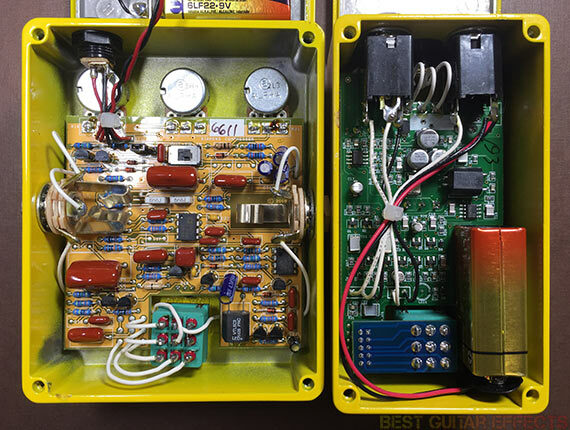 Diamond spent a very long time optimizing the Comp Jr’s circuit layout and finding comparable, smaller components to accurately produce the sound and feel of the larger Compressor. For all intents and purposes, they both sound identical. If anything, I thought I could hear a little more top-end in the Comp Jr a couple times, but with a slight tilt of my head the differences I thought I heard were gone. I’ll touch on this a bit more later, but for now I’ll cover application and use of both pedals. Optical compressors are noteworthy for their organic responsiveness and smooth feel (assuming they’re fine-tuned just right), and these pedals are exceptional examples of optical comps done right. There aren’t parameter controls for attack & release as Diamond have already optimized the Compressor & Comp Jr for use with guitar. The attack is just slow enough so that your pick attack doesn’t get blunted, and the release seems to follow the decay of your notes to avoiding any noticeable ‘pumping’ artifacts. They response was adjusted so carefully, so that you’ll only need one general “Comp” knob to cover the range of compression sounds available. The Comp knob is the key to the Diamond Compressors. Instead of functioning like a Threshold knob where you set its level and then boost your output volume level to compensate for reduced overall volume, the Comp knob on these pedals increases the signal volume going into the compressor, resulting in a louder signal. This means as you increase the Comp, you’ll most likely reduce the Vol control (unless you’re going for a volume boost). As far how Comp is applied and what it sounds like, at a fully counterclockwise position, no compression is taking place. You could then use the Vol control for a clean boost without compression, maybe tweaking the EQ for a little emphasis on certain frequencies if you’d like. As you increase the Comp knob, more squeeze is gradually applied. The entire knob range is musical, even at extreme settings. At the highest Comp settings you may notice less emphasis on your high end, which is where the EQ comes into play in restoring some brightness to your sound. The EQ knob is surprisingly transparent at the center position. I spent a lot of time A/Bing between the Compressor & Comp Jr and activating/bypassing both pedals. I don’t think many guitarists will miss the lack of internal EQ bypass on the Comp Jr as it doesn’t really seem to have a negative impact on your tone at all. In fact, as I just mentioned, in the previous paragraph, the EQ can be essential to emphasizing certain frequencies, especially when using higher Comp settings. While I often like my ‘tone’ knobs to leave the low-end alone completely in tact when boosting or cutting treble, the tilt EQ actually helps to allow jangly tones to pop out more, suitable for mixes with lots of other instrumentation, bright funk guitar tones, and twangier country sounds. Also, using the EQ knob throughout the 10-2 o’clock range doesn’t affect the other side of the frequency spectrum as much. Basically, adding a slight boost to your highs isn’t going to kill your low-end and vice versa. I’ve already stated that these pedals pretty much sound identical. What’s most impressive is that the Comp Jr sounds comparable at all knob settings. The potentiometer values must be similar. Even the knob range of each pedal sounds comparable. If you insist on removing the Diamond Compressor’s EQ control from the circuit perhaps, then you’ll probably want to stick with your trusty Compressor Sr. Maybe that’ll be useful if you only play on lower to moderate Comp settings and are obsessed with eliminating any trace of perceived lack of transparency. As for the internal Hi-Cut option that’s also only available on the larger pedal, I could see this being useful some guitar players who insist on cutting a little highs before their guitar reaches anything else. I personally didn’t mind feeding the normal signal from either Compressor into an overdrive that has its own Tone or Hi-Cut knob. Diamond might have been able to squeeze in these features if they knew guitarists would miss them, but I really don’t think most people will need them. Even if you’re able to detect some hint of difference between the tone of these two pedals, I doubt many guitarists will notice anything so severe as to boycott the space-saving convenience the Comp Jr offers. Again, I thought I almost heard the Comp Jr sounding slightly brighter a couple times, but I concluded I was just looking too hard for a difference after alternating between them for the 50th time. I would, however, recommend dedicated Diamond Comp players to pick up a Comp Jr and do your own split-testing. At best, you’ll probably end up selling your larger unit. At worst, you’ll probably still keep the Comp Jr as more than worthy enough for your other, smaller pedalboard. I’m also very happy that the Comp Jr has the same multi-color LED that provides a visual indicator of when your signal crosses the compression threshold. To me, this was the one sacrifice I had hoped Diamond wouldn’t make (after preserving the original’s tone, of course). It’s not essential, but it helps you feel out the pedal’s style of compression. If you’re new to putting a comp on your board, this little touch will help you see and set your compression. Another thing… as I don’t think I’ve properly emphasized this. These pedals sound spectacular. Diamond’s ‘guitar channel’ idea has been realized exceptionally well. I’d say that these pedals are some of the leading contenders for the best always-on compressor pedals around. As my experience is generally more orientated towards guitar pedals than their studio hardware counterparts, I’ve leaned towards favoring other types of compressors (VCA, FET, OTA) in terms of what I never turn off. But counting the “Diamond Comp” lineup as a single entity, I’d say that any of them can stand on their own and stand alone as a pedal that many guitarists will regard as the ultimate always-on guitar compressor. I can find no faults with these. The Diamond Compressor & Comp Jr are stellar examples of optical compression done right and are excellent candidates for an “always-on” compressor. The compression is smooth, organic, & musical, and the EQ control is particularly useful for shaping your top-end on higher compression settings. The comparable sound and smaller size of the Comp Jr make it especially enticing, and I think now is a great time to check out a Diamond Comp in either form if you haven’t yet experienced what all the fuss is about. The diamond standard has been set. 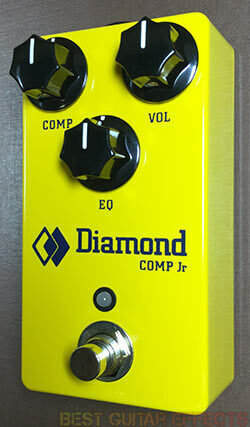 That concludes our Diamond Compressor & Comp Jr review. Thanks for reading. 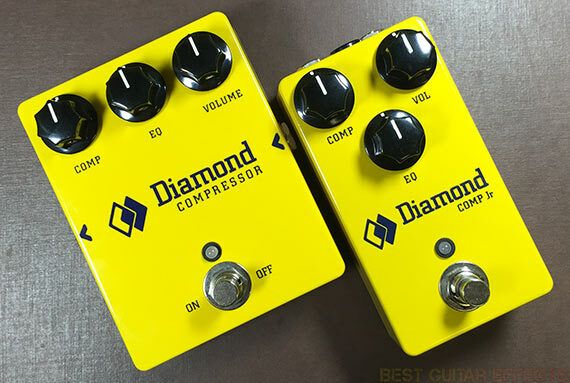 Want to buy the Diamond Compressor or Comp Jr? I strongly feel your review is incomplete, misleading and not at all representative of any long term use of the product. I’ve owned many optical comps starting with this one and it’s firmly the last on my list. It can sound good enough, but for the money it should be damned near perfect. These pedals have a set threshold, as you mentioned, so that means they will distort easily so you have to turn down your guitar volume. You don’t get a very full sound out of them because you can’t feed in a full signal from the guitar. The Keeley Comp+ I just got rid of did the same thing so people aren’t really listening with their ears just buying things thinking it’s a boutique product so it must be the best. When you use the EQ between 10-2 you don’t lose the other side? Well that’s just wrong. Obviously you cannot increase the treble without reducing your bass, and vice versa. I think if people want a good optical comp that is easy to use they should get the DOD280. If you want to endlessly tweak knobs the Joe Meek or even the Carl Martin comps are ok. A good compromise is the SolidGoldFX Compression Machine (you’ll never find one) or the newer Horizon. If you want the same circuit as the Diamond buy a Mooer. They’re the same thing for the right money. I bought the Diamond Comp last year and since then it’s been at every show and practice since. I’ve used it for both bass and guitar and my only problem has been having to take it off my guitar board and put it on my bass board- until last week when I got a Comp Jr! I tell anyone who’ll listen that this is the best compressor for guitar/bass out there. Good to see it get some recognition.